Rethinking Faith and Church: Unveiling Grace: Will the Real Jesus Please Stand Up? Unveiling Grace: Will the Real Jesus Please Stand Up? I remember years ago mentioning something about the differences between Christians and Mormons, when a coworker answered back saying, “Mormons are Christians too; we even have the name of Jesus Christ on our buildings.” I also remember biting my tongue to hold back my then typical less than gracious reply, “Having the name of Jesus on your building doesn’t make you a Christian any more than it makes the swearing atheist using the Lord’s name in vain a Christian.” While I still maintain that my proposed reply would have been true in theory, the grace-less way in which I would have communicated it that day would not have been very Christian either. Somewhere between that day and today, the Lord must have begun softening my heart by making me a little less militant in my approach to people of other faiths. While I am still very much opposed to Mormon (and many other religious) teachings, I am not opposed to Mormon people. The truth of the matter is, I am also in disagreement with many things I see in the Christian institutional church today, but I am not opposed to the people who make up those institutional systems either. I consider myself blessed to have friends and some very fine coworkers who follow many different religious paths. All of them have enriched my life in one way or another, even if we don’t see eye to eye on spiritual matters. The bottom line for me is that, while I was still a sinner, Christ died for me (Romans 5:8). Translation: LOVE. In other words, if God so loved me (John 3:16) while I was still a sinner (in disagreement with Him), it seems to me that He would call me to strive to love others who may not agree with my theology as well. As Jesus said, “Love your enemies and pray for those who persecute you” (Matthew 5:44). 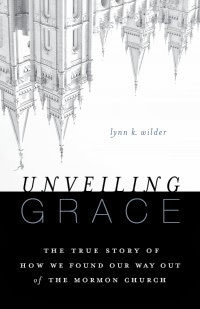 Having said all that, this is why I was so excited to read Unveiling Grace by Lynn Wilder. I have read several other books before on the subject of Mormonism, but this one was different. How so? It was different in that it is the personal testimony of how Lynn and her husband Michael and their four children all found the real Jesus and left the Mormon church. Lynn and Michael were actively involved in Mormonism; Lynn as a tenured faculty member of Brigham Young University, Michael as a high priest, and their three sons having served the Mormon god as missionaries. Lynn does a marvelous job of not just telling her family’s amazing story, but also of explaining many of the subtle differences between Mormonism and true Christianity. She deals with how, one by one, her family's eyes were opened to the deception of Mormonism and gives those of us on the outside a rare look into Mormon culture. All in all, it's a fascinating read that I had a hard time putting down. The book includes helpful doctrinal comparisons of Mormonism and the Bible, as well as an equally helpful glossary of terms. I appreciated these appendices because I have always maintained that, though Mormons and Christians often used that same terms and lingo, in many cases (if not all) they have very different understandings of the meanings of those words. Contrary to what many on both sides have been duped into believing, Mormonism is not simply another in the vast milieu of Christian denominations. So if you're curious about Mormonism, or if you are a Mormon, I highly recommend this fine book. It will open your eyes to the wonderful grace of God. Has Ours Become A Salt-less Gospel? The Key to Unanswered Prayer?